What if you have just one front tooth that is gray or dark yellow, but all of your other teeth are white. What, if anything, can be done to lighten that solo tooth? This is a question that patients pose to us, from time to time, in our office. The most conservative option would be to use a whitening treatment. This works well for teeth that, due to trauma, may have darkened in color. Your dentist will fabricate whitening trays, and you begin the process by applying the whitening gel to only the dark tooth. That tooth will gradually lighten and reach a tooth shade that is comparable to that of the adjacent teeth. At that point, you may choose to apply the whitening gel to all of the front teeth to whiten your entire smile. Sometimes, a tooth that has been treated with root canal therapy will turn gray. In this instance, we can use something called the “Walking Bleach Technique” to lighten the tooth. A small hole is made in the tooth (along the surface of the tooth that is near to your palate or tongue) and whitening gel is applied inside of the tooth. A temporary filling is placed and you leave the office with the bleach in place for three to five days. After that time period, if the tooth has lightened to the desired shade, the temporary filling and bleach are removed and replaced with a permanent restoration. Or, the process may be repeated a second time. 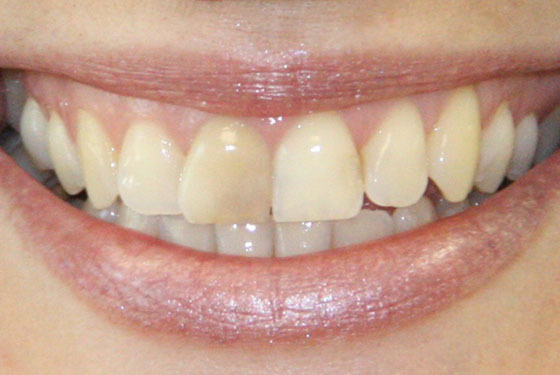 Lastly, a veneer or crown may be used on the tooth to mask the discoloration. This, of course, necessitates the removal of sound tooth structure. The good news is that there are multiple options available to lighten one tooth. And some of these treatments can be completed quickly and with minimal effort on your part. Talk to your dentist, to determine the most suitable course of treatment for your smile.